One of the great but often unmentioned causes of both happiness and misery is the quality of our environment: the kinds of walls, chairs, buildings and streets that surround us. And yet a concern for architecture and design is too often described as frivolous, even self-indulgent. 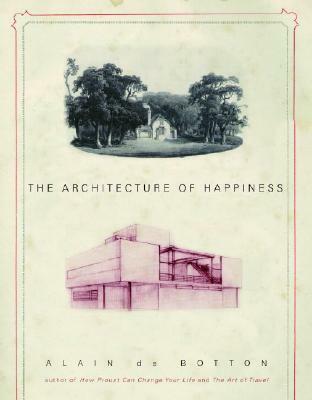 The Architecture of Happiness starts from the idea that where we are heavily influences who we can be, and it argues that it is architecture’s task to stand as an eloquent reminder of our full potential. Whereas many architects are wary of openly discussing the word beauty, this book has at its center the large and naïve question: What is a beautiful building? It is a tour through the philosophy and psychology of architecture that aims to change the way we think about our homes, our streets and ourselves. The next time I'm at a party, and the conversation turns to "serious topics," like what the stock market did today, I think I'll suggest we talk about something more important: architecture. I'll ask the investment banker why he bought the house he did and insist he answer the question. And then I'll start quoting Alain de Botton. If this book were a building, it would be a contemporary reading room, I think, with big windows, and clean, built-in bookshelves with a fold-out step ladder just right for fetching slim volumes from the top shelf. The elegant clarity and brisk humour of his style, accompanied by pages of photos, opens your eyes to the rich possibility of thinking about your home, and your city, in a new way. "De Botton's books are the literary equivalent of the Slow Food movement. They demand to be lingered over, not because the concepts are difficult but because they are rich and deep. Be prepared to put down your book frequently and turn his last few sentences over in your mind, testing his theses against the rooms and buildings you know well." "In this simple, entertaining and brilliant book, Alain de Botton explores how architecture speaks to us and why it affects all aspects of human life. His great strength is to explain things we always knew but never understood."